I watch a lot of anime. And some of my favorites are: Eve no Jikan, Ghost In The Shell, Denno Coil, Pale Cocoon, Vexille, Appleseed, Noein, Animetrix. They inspired me. 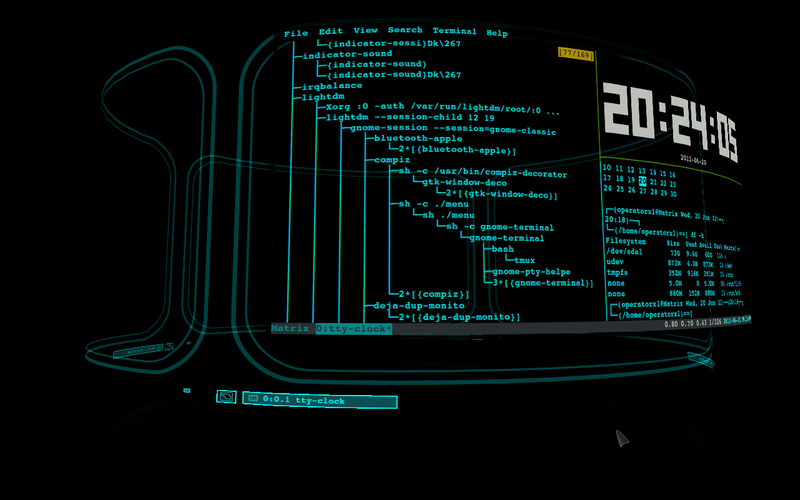 My advice, if you are into designing cool sci-fi futuristic GUI, watch more sci-fi anime. It doesn't matter how old you are. Anime are not made just for children. For example, regular children would not get "Noein: To Your Other Self", it's based on quantum physics. nice.. do you plan on making this available to the public in some way?? tutorials or a download?? i'm relatively new to Linux and still cannot migrate completely to it.. i was surprised how limited of a choice we actually have when it comes down to the actual user interface considering that the possibilities are virtually infinite.. i've expected stuff like yours to be all around..